Although the number of men enlisting from Adair County in the Civil war was very small, the county is justly proud of the part played by her few sons in the great drama of the '60s. Enshrined in the hearts of the people, these men who resolutely faced the terrors of the South, risking life, home, health and everything that was dear to them, in order that the Union might be preserved, truly deserve more than a few scattering words to their memory. It is true that monuments may be erected, the deeds of the brave sung in immortal verse and ennobled in the national literature, but the true memorial the sanctity of the heart will enfold and by word of mouth from generation to generation will the courage, fortitude and sublime self-sacrifice of the "boys in blue" be transmitted in enduring form. History has a purpose; it is to preserve fairly and justly the records of the past, so that a guide may be supplied to the thoughts and conceptions of future men and women when these white pages have grown sear and yellow. There are many men living in Adair County in 1915 who fought for their country in the troop ranks of other states --- New Hampshire, Indiana, New York, the Carolinas and Ohio and other states. It is the least that Adair County can do, to accord them the same honor and homage which she pays her own sons. When the war first broke over the country there were but 984 people living in Adair County. With this small population it was impossible for the county to muster a large number of soldiers for the Union. There were exactly eighty-eight soldiers who went to the war from this county that were accredited to it and several others went outside of the county and were enrolled. Bounties were liberally offered by the county for volunteers. The general reader of today does not appreciate the scope of the word "slavery," just what it meant in those days. The true meaning has either been mercifully expurgated from the pages of modern literature; or, it may be said, it is unfortunate that more has not been written of it, in order that the facts might be common knowledge. The term "white slavery" is well known and the meaning of the phrase brings to us a feeling of loathing and indignation. The slavery of the South was little better, was even more universal and more countenanced. In the ulterior character different in motive, it yet embodied deeds and principles exactly similar to the modern slavery. The inter-relation of the races meant commercial advancement on the auction block, thus the justification. Rome and other Latin countries had their slavery and the national literature does not disguise the dreaded institution. The outbreak of the Civil war has been attributed to many causes. These are all based upon the same thing --- slavery. The political differences and the intrigues and enmities rested on this issue alone. In reading this deduction, many will disagree, for even at this late day there seems to be incontrovertible argument on both sides of the question. Slavery was distinctly out of tune with the times; the attitude of the southerners was falsely aristocratic; all of which tended to their inevitable downfall. The stirring times which followed the Mexican Territory acquisition, the fugitive slave law, the Missouri Compromise, the struggle in Congress, the Lincoln-Douglas debates and the election of Lincoln to the presidency, cannot be detailed in a work of this scope, but a discussion is worthy of place. A greater appreciation of Lincoln's worth is gained when we contemplate the arena into which he stepped in 1860. The utter confusion, the threatening war clouds, and the words of the people, "Let's see what you can do," were stern tests for the backwoods lawyer. The opportunity was given him and his accomplishments are history. War might have been avoided had the North recognized the slaves on the same basis as cattle or any other common property, or, on the other hand, had the South reverted to the sentiment of the North and pronounced slavery an evil. It is evident, however, when the tenor of the day is considered, that these two theories were impossible. The mass of the people on both sides were eager for the actual conflict; mob spirit prevailed in many places; but the greater minds, the leaders, entered the struggle with heavy hearts. Lincoln, Grant, Lee, Jackson and Longstreet, and other foremost figures of the war, were sad with the weight of unjust and useless carnage. The four years' strife, the early success of the Confederate hosts, the high tide at Gettysburg, the slow, merciless pounding of Grant's machine on the depleted Army of Northern Virginia and the final chapter at Appomattox can be no more than mentioned. The early days of the war were attended with much excitement in Adair County. The toll of grim death was to be exacted bore no part in the thoughts of the people; they alone thought of the pomp and circumstance of war, its glory, its martial spirit. The county was strictly Union, in contrast to some of her southern sister counties of the state. M. E. Black, second lieutenant. E. G. Currier, Isaac Hoch, J. M. Stewart, F. M. McAfferty, Charles F. Currier, F. A. Buck, Jacob Augustine, P. C. Barrows, A. D. Littleton, Joseph Clary, Benton Reid, G. W. Lents, Stephen Bish, Myron Bunce, Stephen Carley, Joseph Dugan, C. H. Black, Daniel Dugan, Bice Friend, Isaac Lents, Thomas Lucas, James S. McCall, W. B. Maxwell, S. H. Myers, W. M. Nelson, W. M. Rodgers, J. A. Robison, Jonathan Shreeves, W. B. Thomas, James M. Witte, W. F. Adams, W. R. McCall, P. T. Davis, S. B. Easton, Miles Friend, G. W. Lucas, Edward Lee, Hugh H. McCall, George McCartney, D. S. Moore, E. G. Pendleton, H. W. Rodgers, A. C. Reid, G. W. Thomas, W. H. Wilson, John K. Myers, William L. Bennett. Theodore Brown, Frederick H. Cears. Christopher M. Johnson, Thomas Kenberry, John S. King, M. P. Shadley. John H. White, Samuel M. Kendrick, S. M. McClure, Thomas Miner. A. P. Codner. C. H. Chapman. T. M. Ewing. W. H. Pace. Abner Root, R. E. Ewing, Thomas H. Atwood, W. A. Wilson, John S. Winkley, John M. Crane, Philo G. Sage, John Schweers, M. T. Crittenden, O. H. Colvin, E. C. Goings, F. Pace, Henry Stroup, G. W. Atkins, J. H. While, A. B. Hubbard. John M. Crane, Company I, Fourth Cavalry, died at Atlanta, Ga., July 23, 1865, of chronic diarrhoea. William H. Pace, Company I, Fourth Cavalry, died of typhoid fever at Memphis, Tenn., May 6, 1864. Henry Stoup, Company I, Fourth Cavalry, died at Montgomery, Ala., April 28, 1865, of camp diarrhoea. Miles Friend, Company D, Twenty-ninth Infantry, died at Helena, Ark., February 4, 1863. Isaac Lents, Company D, Twenty-ninth Infantry, died on February 7, 1863, at Helena, Ark. Thomas Lucas, Company D, Twenty-ninth Infantry, died at Helena, Ark., February 5, 1863. William B. Maxwell, died at Keokuk, Ia., July 16, 1863; was member of Company D, Twenty-ninth Infantry. George McCartney, Company D, Twenty-ninth Infantry, died February 2, 1863, at Helena, Ark. D. S. Moore, same company and regiment, died at Memphis, Tenn., March 27, 1863. W. B. Thomas, same company and regiment, died March 1, 1865, at New Orleans, La. James M. Witte, Company D, Twenty-ninth Infantry, died at Helena, Ark., May 13, 1863. John C. Carpenter, Company B, Fourth Infantry, died of camp fever October 6, 1861, at Rolla, Mo. Jacob Augustine, Company D, Twenty-ninth Infantry, died at Helena, Ark., February 3, 1863. C. H. Black, Company D, Twenty-ninth Infantry, died February 3, 1863, at Helena, Ark. Stephen Bish, Company D, Twenty-ninth Infantry, died at Helena, Ark., July 9, 1963. Daniel Dugan, Company D, Twenty-ninth Infantry, died of pleurisy, January 27, 1863 at Helena, Ark. S. B. Easton, Company D, Twenty-ninth Infantry, died January 29, 1863, at Helena, Ark., of typhoid fever. Bice Friend, Company D, Twenty-ninth Infantry, died of erysipelas at Helena, Ark., January 29, 1863. The regiment was organized at Council Bluffs and mustered into the service of the United States at that place on December 1, 1862, with the following officers: Thomas H. Benton, Jr., of Council Bluffs, colonel; R. F. Patterson, of Keokuk, lieutenant-colonel; and Charles B. Shoemaker, of Clarinda, major. The regiment was ordered to Helena, Ark., but upon reaching that place was not detrained, but ordered to join an expedition then being organized by General Gorman, to go up the White River. This expedition resulted in no good to anybody, but on the contrary, was the cause of much suffering to the troops. In April and May, 1863, the Twenty-ninth formed part of the expedition to Fort Pemberton and came back to Helena in time to take part in the attack on that place on the 4th of July, 1863. Helena had been made a depot of supplies and recruits and was a source of much uneasiness and alarm to the rebels, still holding the most of Arkansas, threatening, as it did, the more important points therein. Brigadier General Holmes of the Confederate army was ordered to take it. Re-enforced by the troops of Generals Sterling Price, Fagan, McRae, Walker, Marmaduke and Parsons, until his force numbered 7,646 men, he appeared before the place. Helena was fortunately under the command of Maj. Gen. B. M. Prentiss, who had 3,800 effective men behind strong earthworks, mounted with serviceable guns, with the main approaches covered with abatis. The gunboat Tyler, under command of J. M. Pritchett, was also in hand and played an efficient part in the defense. The Twenty-ninth was drawn up in line of battle at daylight and marched across the bottom of their position on Sterling Road about 4:30 o'clock. Two companies were immediately set forward to drive the enemy from their position on the crest of the hill, but, finding them too strong, other companies were sent to their assistance, until eight were thus employed. In the meantime, the enemy had got two guns into battery, with which they opened a brisk fire and under which their line pushed rapidly forward, cheering and exulting as they advanced. Our skirmishers met them with a galling and incessant fire, under which they gradually fell back, contesting the ground inch by inch. The skirmish line of the Twenty-ninth now pressed the rebels back to the crest of the hill, previously held by the Confederates, compelling them for a time to abandon their guns, which, however, after several ineffectual attempts, they recovered, leaving one caisson on the field. The regiment, supported by the Thirty-sixth Iowa Infantry, in this contest was pitted against one brigade of five regiments of infantry, one battery and two regiments of cavalry, and reported a loss of seven killed and twenty-four wounded, some mortally and many of them severely. On the 1st of August, 1863, General Rice's brigade to which the Twenty-ninth was attached, became a part of the expedition intended for the reduction of Little Rock, Ark., under command of Maj.-Gen. Frederick Steele. Leaving Helena August 11, 1863, after a fatiguing march, they reached the front of the enemy's works before the city on September 10th. Fully expecting a severe contest for the possession of the capital of Arkansas, they were disappointed, the enemy evacuating the place upon the charge of the cavalry division under General Davidson, who was in the advance. The Twenty-ninth was on duty in Arkansas with the remainder of the division throughout the balance of the years 1863-4 and had several engagements with the rebels. On the morning of the 2d of April, 1864, the Twenty-ninth was assigned to position of rear guard to the supply train, together with a section of Captain Vogler's battery. While the train was passing through a narrow, muddy defile made by a small stream, about a mile beyond Terre Noir Bayou, a battalion of Shelby's cavalrymen made an attack on the rear, but was held in check by the left wing of the regiment. As soon as the advance had cleared the ravine Colonel Benton ordered the line to be formed and the battery into position and opened upon the advancing rebels. This was responded to with spirit and accuracy with two pieces of artillery. The enemy fell back, but made demonstration of a flank attack on the left, whereupon Colonel Benton with his regiment returned to Terre Noir Bayou, where the rebels again renewed the attack. This was met as before by the fire of the battery and a few rounds of musketry, which sufficiently discomfited the rebels to enable the Union line to fall back under cover of the fire of the skirmish line to a hill two miles distant. At this point the regiment was deployed on each side of the road and the battery placed into position and the enemy came up in force and made a desperate charge on our left wing, but was promptly repulsed, upon which he fell back, crossed the road, and attacked the right with no better success. The engagement lasted about an hour and a half, although the Twenty-ninth was not engaged any more, the brunt of the balance of the conflict being borne by the Fiftieth Indiana Regiment, which had just come up. The loss of the Twenty-ninth in this battle was twenty-seven killed, wounded and missing, including among the wounded three commissioned officers. In the engagement of April 4th at Elkin's Ford on the Little Missouri, this regiment was ordered forward by general Rice across the bayou and drawn up in line of battle in the rear of four companies of the Thirty-sixth Iowa, under the command of Lieut.-Col. F. M. Drake. The left wing was subsequently ordered back across the bayou under Major Shoemaker and drawn up in line in the rear of the remaining six companies of the Thirty-sixth Iowa, and the right wing was ordered to fall back to the bank of the bayou. No part of the regiment was engaged with the enemy and the casualties were confined to one man wounded. On the afternoon of April 10, 1864, another engagement was had with the enemy at Prairie d'Anne, where the regiment was ordered into position as reserve in the rear of the Thirty-third Iowa. The line of battle having been formed, it was propelled forward, skirmishing with the enemy, but driving them back at all points, and the march resumed toward Camden. On the morning of April 30, 1863, the Twenty-ninth was also engaged in the battle of Jenkin's Ferry. The official report on this battle speaks in glowing terms of the gallantry of this favorite regiment. Colonel Engelman, commanding the brigade, thus officially speaks of it as: "One of the most sanguinary engagements of the war and was fought exclusively by infantry, the section of artillery brought into position only to be taken by a combined charge of the Twenty-ninth Iowa and the Second Kansas. The ground over which the battle was fought, with the exception of two open fields near the road, was a majestic forest, growing out of a swamp, which was very difficult to pass on horseback, the infantry being up to their knees in water most of the time." Between the 11th of August and the 10th of September, 1863, the Twenty-ninth, with the balance of the army, marched with General Steele to Little Rock. The weather was exceedingly hot and dry and there was little of any worth transpired except the difficulty of the march. Many were sunstruck and it was impossible to get all the sick in the ambulance. This campaign ended in the occupation of Little Rock, where the regiment went into winter quarters. In the spring the regiment was unfortunate enough to be a participant in the Red River expedition, following General Steele in what was known as the Camden campaign. On the return of the army to Little Rock a reorganization was effected and the Twenty-ninth was assigned to the First Brigade of the First Division. It was afterward transferred to the Second Brigade, Second Division, where it remained until the end of the war. The regiment remained at Little Rock nearly a year, except about a month from the latter part of July to the 1st of September, when it was stationed at Lewisburg on the Arkansas, fifty miles above Little Rock. When Gen. J. J. Reynolds assumed the command of the Department of Arkansas, there was another reorganization of the army. In this the Twenty-ninth was assigned to an organization known as the "Detached Brigade of the Seventh Army Corps" and Brig.-Gen. E. A. Carr was made the commander. Under this leader they received orders to proceed to New Orleans, on which expedition they started on the 9th of February, 1865. After a tedious voyage the regiment reached New Orleans on the 14th and 16th of February. The Twenty-ninth was quartered in an old foundry in Algiers, across the river from New Orleans. On the 20th the regiment moved by rail to Lake Port on Lake Ponchartrain and thence by steamer to Mobile Point, Ala. The vessel on which they were embarked ran aground in Grant's Pass, one of the inlets of the harbor of Mobile, and they had to be transferred to another steamer. They were disembarked on February 23d and without tents or baggage went into bivouac on the sands of Navy Cove, three miles in the rear of Fort Morgan, one of the defenses of Mobile. The preparations for the campaign now commenced. On March 17th the army proceeded toward Mobile. On the 25th it found itself under the guns of one of the strongest defenses of the city, Spanish Fort. and at once began its investment. After the capture of Spanish Fort the regiment marched to the assistance of General Steele, who was investing Fort Blakely, another of the defenses of Mobile. Later the regiment entered Mobile and immediately left for Mount Vernon arsenal. On the 1st of June the regiment sailed for Texas. When General Sheridan assumed command of the Military Division of the Gulf he directed the immediate muster out of the Twenty-ninth. The regiment sailed for New Orleans in the latter part of July and on the 10th of the following month was honorably discharged from the service. When President McKinley issued his first call for volunteers in April, 1898, a score or so Adair County boys were upon their feet and eager to enlist in the forces of Uncle Sam. They were accordingly taken to Des Moines and were mustered into Company G, Fifty-first Iowa Volunteer Infantry. This company was mostly raised in Creston. The men who composed this first enrollment from Adair County were: J. F. Grounds, first sergeant; Daniel W. Gaines, corporal; Ezra J. Brayton, Harry Carver, Leroy Darby, Martin G. Dunlap, Charles E. Geesman, Herbert M. Griffith, G. B. Hetherington, Fred M. Ickis, Ernest C. James, W. B. Martin, Jr., Fred Neeley, Ernest O. Patterson, Roy Reno, Vern W. Shrader, William Wallace, Wesley Witter. By the first of June many more men were ready to enlist and Lieut. R. J. Gaines came up from Creston to recruit them. Those who went at this time were: Fred Lovely, Harry Wilson, Howe McCollum, Milo Witter, Will Stryker, all from Greenfield; C. L. T. Herbert, George Sines, Richard Henry, William Arthur, Robert Ebv. R. V. Stevens, William McLaren, Vess Fisher, Ed F. Ross, E. Spangler, W. Merrill, Ed Kempter, Ed Sutphin, C. J. Cissne, Walter Hostetler, Frank Humphrey, James Gillespie, James Needles, William Witter, L. Stoner, William McKelvey, Robert Britten and Fred Carver. Carver died of typhoid fever at the Presidio and his body was returned to Fontanelle and buried in Fontanelle Cemetery. Hayes Hendry, son of J. G. Hendry of the Union Bank of Bridgewater, was a soldier in the Philippines and died there. His body was returned by the Government and buried at Bridgewater. The regiment was mustered into the service on May 30, 1898, and directed to await orders from the War Department. On June 2d they received orders from the adjutant general, U. S. A., assigning them to the Philippine expeditionary forces and directing them to proceed to San Francisco, Cal. On June 5th the regiment was placed on three separate trains and reached San Francisco on the morning of June 10th. 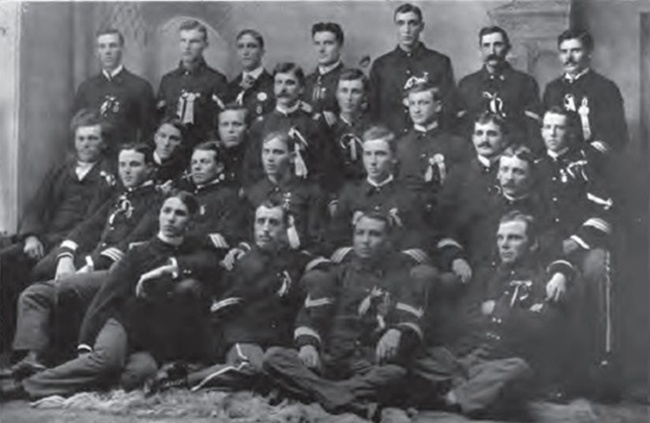 Just before leaving Des Moines, which was accepted into the service with sixty-five men to each company, was ordered to be recruited to the maximum strength of 106 men to the company. Recruiting officers were left in Iowa to enlist and forward the requisite number of men. By the latter part of June the regiment had been recruited to its full strength, 1,332 men. The fact that the regiment was the last to be assigned to the Philippine expeditionary forces and next to the last to reach San Francisco, and the further fact that it contained so many recruits and they not properly and comfortably equipped, was the cause of its not being sent to the Philippines in June or July. Camp Merritt was an unhealthy camp, being located so near the ocean where the cold winds and fogs were almost continuous. On July 29th the men were moved to the Presidio, where they were more sheltered. During all this time they were given daily drills and target practice. On November 3d the regiment went aboard the transport Pennsylvania and the same day sailed for Manila. At this time the regiment had been reduced from 50 officers and 1,332 men to 50 officers and 1,040 men; 27 men had died of disease in San Francisco. All the men who were unfit for service and those having urgent necessity for being relieved from the service were discharged. Manila Bay was reached on the morning of December 7, 1898. The regiment was assigned to the First Separate Brigade, Department of the Pacific, and Eighth Army Corps, Gen. M. P. Miller commanding. They departed for Iloilo, Panay Island, on December 26th, and by the 30th had moved to within one mile of the city. Pursuant to special orders, No. 29, First Separate Brigade, Eighth Army Corps, left the harbor at Iloilo and arrived at Cavite on January 31, 1899, remaining on the transport during the whole month of January. The last troops were not yet ashore when the storm of war descended. At 11 o'clock Saturday night, February 4th, the call to arms was sounded; word was sent that the insurgents had attacked the Americans at Manila. From across the bay the thunder of guns and the roll of volleys told that the outbreak had come at last. It was expected that the natives would attack Cavite from San Roque, but they did not and the men slept on their arms. For a few days the regiment had only to do guard and outpost duty. On February 8th Admiral Dewey ordered that a flag of truce be sent to the insurgents of San Roque and that if the town was not evacuated by 9 A. M. February 9th he would bombard the town. When 9 o'clock arrived San Roque was in flames. The natives had fled, firing the town and thousands of dollars' worth of property. The following troops were ordered to enter the town and save the capital: Third Battalion, Fifty-first Iowa, commanded by Major Moore; California Heavy Artillery with three gatling guns, under Major Rice; Second Battalion, Fifty-first Iowa, under Major Hume; and a troop of Nevada cavalry. They advanced about three miles with slight skirmishing to the causeway beyond the town, across which the outposts of the enemy were posted; there a strong position was taken. On February 11th the Second Battalion returned to Cavite and the Third Battalion remained on duty. It was a trying position. The outpost duty was exacting and the troops were frequently exposed to the enemy's fire. On February 15th the insurgents made an advance, but were soon driven back by the fire from the artillery and volleys from Company I. On February 11th a battalion of the Fifty-first Iowa was ordered to Manila at once. The First Battalion, Companies H, F, A and D, under command of Major Duggan, was sent. At nightfall this command embarked in lighters and were towed across the bay. The battalion was landed on the luneta and received instructions to report to General Anderson on the south line, about five miles south of Manila. Assistant Surgeon Macrae was detailed to accompany this battalion. The First Battalion bivouacked for the night near an old monastery at Pasai and here for a time encamped. A few miles to the left there was frequent heavy firing and night after night the troops were aroused by the booming of field batteries and the rolling of machine guns and the sound of volleys. Brisk firing in the immediate front was frequent and all the companies soon knew the song of the Mausers. For several days the men were kept busy building trenches and otherwise strengthening the lines. The battalion was attached to General Ovenshine's brigade, the Second Brigade, First Division. Companies of battalion served in the vicinity of Culi Culi Church, Pasai, and San Pedro, Macati. The service here was arduous. Day and night a harassing fire was kept up by the sharpshooters of the enemy concealed in the bamboos and jungles in front. Outpost duty was perilous and there was constant hazardous scouting and patrolling. On March 28th, while with a scouting party from Company H, Private Fred Borduwine was cut off in the midst of a hot fire from the insurgents. Information gained later was that he was wounded in the leg, captured and taken to Malivay by the Philippine natives. 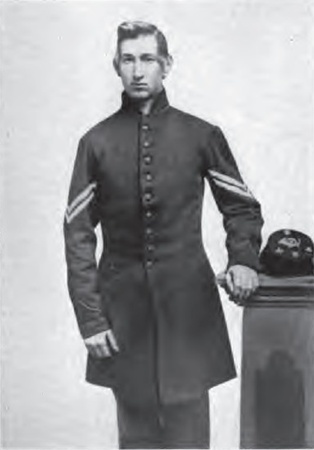 Captain Worthington at once took out a party of eighteen men from Company H and six from Company A, all volunteers, to search for the missing man. The scouting party had been fired upon near a stone culvert where the dry bed of a small stream intersects the road running south from Culi Culi Church. Captain Worthington's party entered the creek bed a good distance east of the bridge and followed it along until the scouts could reach the ground where Private Borduwine was lost. Here the enemy was soon encountered. A sharp and brilliant skirmish followed, in which the insurgents were roughly handled. Many were killed and wounded, while the Americans, moving back by the left flank, retraced their course without loss. Private Borduwine was never found. The advance on Calumpit was planned to begin on Monday, April 24, 1899. Fighting was precipitated a day before this, however. The day was intensely hot and in the open rice fields the men suffered greatly. For three hours the struggle lasted and then the Filipinos were forced from their position, and Quingua captured. That night the entire regiment was concentrated at Quingua and at daybreak Hale's brigade crossed the Bagbag River, after slight resistance, and moved down parallel with the right bank of that stream toward Calumpit. The firing, from two to three miles in length swept the country clean as it advanced. The Iowa troops were on the extreme right. In the course of a toilsome day's work under a boiling sun, the brigade fought its way through miles of rice fields and jungles, beset with trenches. Near the town of Pulilan, a short distance from Quingua, the right of the regiment encountered a strong force. It was routed and eighty Filipinos killed. That night the regiment bivouacked along the newly captured trenches. The next day Calumpit was taken by storm. The natives had built their trenches up with railroad iron and ties and had boasted that they could not be taken, but, although the fortified position was the strongest the Americans had encountered to date, they were successfully occupied. On May 4th the division advanced on San Fernando, the insurgents' capital. A day of unequaled toil and hardship followed. By superhuman efforts the Iowans plowed through the mud of the Canduba Swamp and drove the enemy in full retreat, through Santo Thomas. Here the division bivouacked. The following morning the troops descended on San Fernando; General Hale directed the troops in person. The Iowa troops charged across the river before San Fernando, scattering a force of insurgents left behind to burn the town, and sent them flying across the fields. The Fifty-first claims the honor of having been the first to enter the town. One man was wounded. Beginning with June 16th there were frequent counter-attacks by the insurgents on San Fernando, but none were successful. On August 9th ten companies of the regiment were formed and marched to the outpost of the Seventeenth Infantry, where they deployed as skirmishers on the right of the railroad, and advanced on Calulut, meeting with considerable resistance from the enemy. So reduced was the regiment by hardships and so thinned were its ranks by disease and wounds that but 326 men out of the ten companies were available for duty when Calulut was reached. After a period of provost, outpost and patrol duty in San Fernando, the regiment was relieved by the Fourth Cavalry, and they were assigned to quarters in the walled City of Manila. On September 22d the regiment sailed for San Francisco on the transport Senator, there to be mustered out. Visits were paid to Japan en route. On October 22d the regiment went into camp at the Presidio and there mustered from the service on November 2d. Of the 1,320 men who left Iowa in the Fifty-first only about eight hundred names remained on the rolls when they returned. Fifty-two men were invalided, 71 men and 2 officers re-enlisted in the regulars and 40 were discharged. The continual skirmishing and severe service that the regiment saw for about six months in Luzon induced much sickness and when the orders came to leave the front for home only 218 men of the regiment were fit for duty. On Tuesday morning, November 7, 1899, the train arrived in Greenfield from Creston, bearing the boys back home. Bells were rung, whistles blown, cannons fired and almost the entire town cheered themselves hoarse as the soldiers alighted form the cars. A parade was formed, headed by the band, then came the Grand Army of the Republic, then the Philippine veterans, the mayor, the council, the L. W. A. C. and students of the public schools with their teachers. At the south entrance to the public square the procession passed under the arch erected by the W. R. C. with the inscription, "In Honor of Our Boys." They paraded once around the square and entered the courtyard through the arch erected by the L. W. A. C., bearing the inscription, "Home, Sweet Home." Once in the courtyard the parade rested and everybody grasped the hands of the bronzed soldier lads. When all greetings had been exchanged Mayor W. W. Don Carlos, in a short speech, welcomed them home. Lieut. R. J. Gaines responded with a short talk. The banquet to the returned soldiers was held at the Warren Opera House on Wednesday. People from all parts of the country came, laden with food. The soldiers, their parents and relatives occupied the tables on the south side of the hall. A few speeches were made. In the evening a program of speeches and music was held at the same place, the soldiers sitting across the front of the stage. The following are the names of the men who returned from the Philippines at this time: R. J. Gaines, Dan Gaines, Charles Geeseman, Leroy Darby, Fred Lovely, Frank Humphrey, Ernest James, Fred Neeley, William Witter, Wesley Witter, Walter Hostetler, William Wallace and Ezra Brayton. The photograph accompanying this article was taken shortly after the men returned to Greenfield. Top row, left to right: Martin Dunlap, Charles E. Geeseman, Tarr, Frank Humphrey, Fred Neeley, William Witter, Walter Hostetler. Third row: Del Wiggins, Ezra J. Brayton, Ernest C. James, Lieut. R. J. Gaines, E. O. Patterson, Dan Gaines, W. R. Martin, Jr., Leroy Darby. Second row: Fred Lovely, Will Stryker, Henry Wilson, Wesley Witter, George Fraser. Lower row: Al McCollum, George Hetherington, William Wallace, Wiggins. E. R. Gantt, sergeant, Company I, Tenth Iowa Infantry. C. G. Cleland, private, Company G, Seventh Wisconsin Infantry. W. V. Hamlin, lieutenant, Company I, Third Pennsylvania Cavalry. E. W. Piper, private, Company B, Ninety-first Illinois Infantry. Nathan Mason, private, Company A, One Hundred Forty-eighth Illinois Infantry. S. G. Brown, private, Company B, Fifth Iowa Cavalry. David King, private, Company H, One Hundred Forty-sixth Illinois Infantry. T. M. Gile, private, Company G, Forty-fifth Illinois Infantry. C. E. Sampson, sergeant, Company D, First Iowa Cavalry. Ed Morris, private, Company G, One Hundred Thirty-ninth Illinois Infantry. W. M. Rodgers, private, Company D, Twenty-seventh Illinois Infantry. Peter Hoover, private, Company G, Eighty-sixth Ohio Infantry. William Romesha, sergeant, Company C, Fifteenth Iowa Infantry. H. P. Wobert, Company D, Seventh Iowa Infantry. J. P. Sinclair, private, Company F, Forty-third Indiana Infantry. Abraham Miller, private, Company B, Fiftieth Illinois Infantry. M. S. Doane, sergeant, Company K, Thirty-ninth Iowa Infantry. J. A. Hetherington, drummer and private, Company I, Seventh Pennsylvania Cavalry and Company K, Fifty-sixth Pennsylvania Infantry. Oswin Cahow, sergeant, Company D, One Hundred Twelfth Illinois Infantry. Zadock Perkins, private, Company D, Second Iowa Cavalry. D. M. Priddy, Company L, Sixth Iowa Cavalry. G. C. Havens, Company B, Twenty-fifth Iowa Infantry. A. L. Harrison, Company B, Thirty-ninth Iowa Infantry. Jasper Reno, Seventh Indiana Battery. T. J. Harvey, Company E, Fifteenth Indiana Infantry. Franklin Letts, Company D, One Hundred Second Illinois Infantry. H. B Goodman, Company D, One Hundred Forty-fourth New York Infantry. J. M. Hetherington, Company H, Twenty-fifth Pennsylvania Infantry. Joseph Sevasin. Company E, Fifty-eighth Illinois Infantry. J. G. Goodman, Company B, Ninety-fifth Illinois Infantry. J. M. Bean, Company A, Ninth Kentucky Cavalry. Fleming Bevens, Company C, Nineteenth Iowa Infantry. J. G. Orr, drum major, Company H, One Hundred Twenty-sixth Illinois Infantry. E. J. Stevenson, Company K, Seventh Illinois Cavalry. James McNair, Company A, Eighth New York Artillery. S. A. Gordon, Company F, Thirty-ninth Iowa Infantry. William H. Needles, Company I, Twenty-second Wisconsin Infantry. Nathan Wertman, sergeant, Company G, Ninety-third Illinois Infantry. William Mitchell, Company K, Eleventh Iowa Infantry. Thomas Kennedy, naval ship, Springfield Fairview Cemetery. J. U. Young, Company B, Twenty-fourth Iowa. William H. Anderson, corporal, Company H, One Hundred Nineteenth Illinois Infantry. Henry Taylor, Company B, Thirty-ninth Iowa. Richard Wallace, Company F. Ninth Michigan Infantry. William Bacon, corporal, Company E, Eighth Iowa Infantry. J. C. Mason, corporal, Company A, Thirteenth Iowa Infantry. Charles Foster, Company K, Fourth Iowa Cavalry. J. I. Calwell, One Hundred Sixty-sixth Ohio Infantry. LeRoy Darby, corporal, Company G, Fifty-first Iowa Infantry. A. L. Bales, Company K, Fifty-first Iowa Infantry. C. D. Letts, Company I, Fifth United States Infantry. The following are the names of some of the living veterans of the Civil war in Greenfield: J. C. Wood, Washington Carl, J. A. Patterson, Clark Chadwick, C. D. Knapp, Fred Cahou, S. N. Smith, Marion Young, J. J. Myers, Henry Booher, H. T. Wakefield, B. F. Childs, R. M. Quimm, William Gillham, J. Flemming, Joseph Gillett, Kier Elliott, M. S. Ray, Abram Gordon, J. F. James, J. M. Humphrey, J. C. Thompson, A. Phillips, J. I. Hillingsworth, S. F. Shirk, W. G. Bell, J. A. Evans, C. D. Sackett, P. A. Bivington, H. M. Foreman, George Bennett, H. A. Gilbert, J. L. Pearce, William McNay, H. C. Stuart, T. W. Brown, J. C. Lane, Austin Miller, D. D. Pettit, George Hanks, W. A. Hoskins, L. M. Kilburn, William Johnston, L. S. Gatch and A. J. Kingery. New Hampshire Voluntary Infantry, in 1862. Veterans living and buried in other towns of county may be found in the story of those localities.